Are you looking to give the perfect gift to a new or expecting parent awaiting a baby boy? Need a stunning baby shower centerpiece? 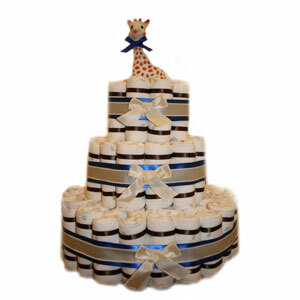 Our Organic Elegant Blue 3 Tier Diaper Cake is a perfect choice. Decorated with vivid blue and ivory ribbon, guests will find themselves marveling around it since it looks so deliciously beautiful, not to mention, it will be the most memorable baby gift for the expecting mom. Sophie the Giraffe BPA free teether.